She began teaching in 1979 in Rome, in a school founded by Ms. Bianca Maria Scabelloni, where a teaching method inspired to Rudolf Steiner's pedagogical indications was followed. In order to best meet the educational needs of children, she has attended courses in painting, pottery, music, singing, theatre education and psycomotor education. To enrich her knowledge and educational experience, she has also worked in the Steiner field of therapeutic pedagogy. 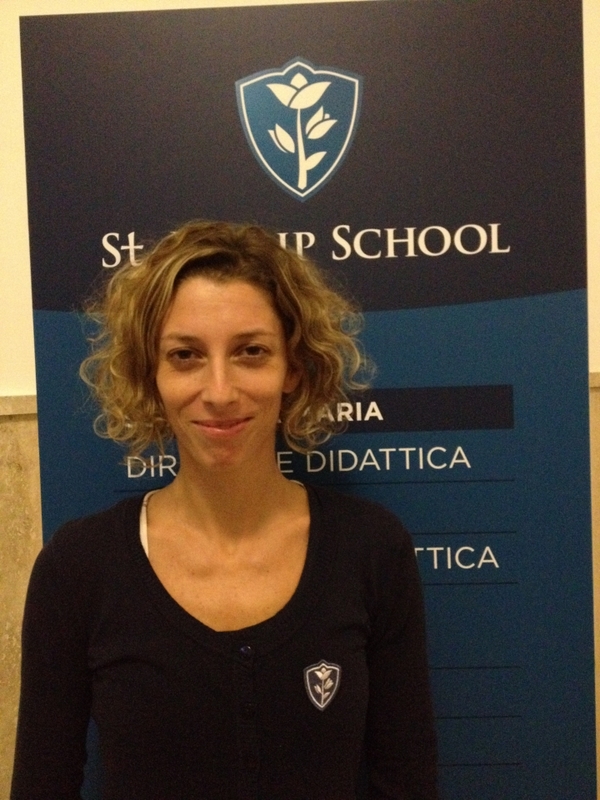 From 2010 to 2013 she taught at Sant'Ivo Institute of Rome and in the school year 2013-2014 she worked at the state kindergarten. She inherited from her mother, a teacher at the State Kindergarten school, the passion for children's education and she decided to follow in her mother’s footsteps. In 2008 she graduated in psychology at the Università degli Studi di Roma "La Sapienza", and in 2013 she graduated in Pedagogical Sciences at the University of Rome "Roma Tre". At the age of 7 years she joined Agesci and since 2006 she became Chief scout of her group. She started the training within the Association and in 2009 she was made the "leader of the Pack", whom is the teacher responsible for the children. The scout service and volunteer activities to which she has devoted her time over the years to meet children and young people with different disabilities and to establish with each a genuine educational relationship. Since she was very young she worked as a nanny and a teacher for several families and in different social contexts, taking on roles of increasing responsibility and independance. Thanks to more indepth studying and many workshops and training courses, including the Montessori specialisation she improved herself in new educational, expressive and artistic techniques. After graduation she started to assume positions as an educator at nurseries and Kindergarten school of the municipality of Rome. She grew up in a large family of six people, has always been in contact with the world of art, pedagogy and music by her father, a homeopathic doctor, who has been acting as a doctor in Waldorf schools. After graduating first in art at the Ripetta school, she graduated from the University of Education of Roma Tre. She started at the Institute Sant'Ivo working as an educator in the pre-kindergarten, then she was a kindergarten teacher and lastly head of the art laboratory. She worked at the pre-kindergarten, l’Albero d’Oroin, the role of educator and teacher and works with Ilyo's Association to promote artistic and cultural events in the centre of Rome. Born in Ireland, she works in the family business for many years and decides to take a different path in life, therefore she enrols in the university of Limerick in Ireland where then she graduates in BA Languages, literature and cultural studies. In this university she also graduates in the course TEFL (teaching English as a foreign language) with grade A. After achieving a university degree, she decides to move to Italy where she works as an English teacher, teaching adults and children. During this period she develops the passion for teaching young learners and begins to work in a kindergarten school where she teaches English through music, games and daily routine. In Italy she also finds love and with the birth of a boy she adopts the same methods of teaching to her son. She has always taught English and develops every day the love and passion of teaching to children. After the Diploma of Liceo Socio-Psico-Pedagogico obtained in 2011, curriculum Brocca-musicale, at the Istituto Magistrale F.lli Maccari of Frosinone, she graduated at the early age of 2 in Science of Education at the University of Cassino, firmly interested in continuing her studies focused on pedagogy. In 2014 she chose to continue her university studies and enrolled in the Master's Degree in Pedagogical Sciences, and in the same year she began to gain experience at Kindergartens, both state and private, as a trainee. In 2016 she graduated with with full marks and honour and started to work as substitute teacher in nursery schools and kindergartens. Daughter of an Italian father and British mother Giulia was born and raised in Chester , North West England. After completing her secondary education she moved to London to continue her further education obtaining a BA Hons degree in International Business Studies with Italian and Spanish from Brunel University followed by the Cambridge T.E.F.L certificate in order to be able to teach English as a foreign language. She worked for a year for a private school in Madrid teaching English to both children and adults. In 1997 she moved to Rome where she continued her teaching in a language school . Over these years she taught English to a variety of age groups and levels: from elementary to preparation for official Cambridge exams, such as KEY, PET and FCE and also the IELTS exam and Business English. Upon getting married and deciding to start a family in 2001 she changed career direction and worked part time for many years in the tourism industry in order to be able to dedicate her time to her three children who are all bilingual. Kevin is a native English speaker from Dublin, Ireland. He graduated with a First Class Honours Degree in Law from University College Dublin(UCD) in 2016 and a First Class Honours Masters Degree in Data Protection Law from Trinity College Dublin in 2017. Kevin began his teaching career in European Union Law in UCD immediately after graduation. He originally taught university students, but since moving to Italy in 2017 he has worked in several public schools teaching the English language to middle and lower years with passion, enthusiasm and ability. Kevin is an accredited Cambridge examiner for IGSCE subjects and has examined hundreds of students for English as a Second Language Oral Examinations. Kevin has always had a passion for teaching, and for languages, and is now following his mother's example of teaching children. She obtained a double degree in piano at the College for Music under the guidance of maestro Sergio Cafaro, and in music education at the Accademia Musicale Pescarese. She continued her studies attending the courses of the Conservatorio di Santa Cecilia in Rome, and others, recognized by the Ministry of education. She has been teaching with passion piano and propaedeutics music for 25 years and music education for 12 years at the nursery and primary school Sant'Ivo in Rome. She graduated in music therapy at the l.U.Me. N.A. and she worked as a trainee at the Maternity ward of ASL RM XVI under the supervision of neuropsychiatrist Maria Brahmins. She majored in music in pregnancy and she developed and created some activities she proposed in the context of childbirth preparation classes at Gemelli hospital. Following the birth of her first daughter, she delved into the Gordon method, specializing in music education for young children. She founded and run the Cultural Association S.I.N.G. which aims to spread music education through instrument courses for all ages and concert lectures for schools. She organizes concerts in which children and teenagers can experiment with various musical instruments as soloists, Chamber music performer and orchestra. She firmly believes in the importance of music practice from an early age, to improve both human and affective relationships, in children and teens. She has dedicated her life to the teaching of music because she does believe in the beneficial power it has on the human being and because she loves to teach children.